Hi, my name is Arno. 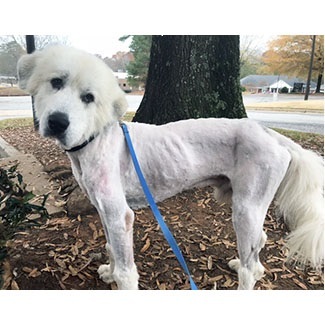 I am a sweet 3.5 year old Great Pyrenees that is a little underweight right now only being at 76 lbs. As you can see my beautiful white coat is missing. But do not worry, it will grow back quickly and more beautiful then ever before. I am looking for a new family this holiday season to keep me and my belly warm. I came into GPRA from a local shelter that knew I deserved a second chance. I have been around new people who are showing me so much love that I just feel that I have to give it back ten folds. I am good around other dogs that I have met and plan on being a best friend to my humans. If you think you have the extra room in your heart and home for me, contact GPRA today at info@greatpyratlanta.com.